Based off of the TV show "Barbie Life in the Dreamhouse", Barbie's Dreamhouse Party takes place in the same environment. The 3D graphics and characters look just as good as the show! The plot in this game is that Raquelle was exploring Barbie's dreamhouse and flipped a switch that transformed every room into a party game. Sadly each party starts off the same where Barbie and her friends must locate four similar objects and place them in the correct order on the pedestals. After this challenge is completed mini-games, movies, pictures and wardrobe accessories become available. There are several rooms draped in pink to explore including a toilet-less bathroom and a garage more suited for washing cars than storing them. I found it humorous that each room has a turnstile corner that allows Barbie and her friends to change and accessorize their outfits. Barbie's closet robot (who looks similar to Wheatley from Portal 2) is the game show host. During the minigames, an enthusiastic Ken bashes and encourages the girls on their performance. Closet, the robot, on the other hand, is rather boring and dull. Then again, I wouldn't be very excited about seeing who can wash and groom dogs and horses the fastest. Something tells me I'd have a hard time convincing my lady friends to partake in a race to bathe, brush the teeth and trim the nails of my pets the next time they come over. I enjoyed the dancing and runway mini-games though. One of the sillier mini-games took place in the garage where Barbie and her friends had to collect giant cogs from the soapy floor and put them back in place. If they were not careful they could fall or get trapped in a bubble. While I found this game to be over the top goofy, my daughters (the target audience) enjoyed accessorizing their characters. So much so that they would yell at each other to get out of the closet and let the other have a turn. Hopefully they don't spend three hours a day worried about their appearance like Barbie. At first the clothes and jewelry selection is limited, but as mini-games are completed more and more items become available. Some of the unlocked clothing includes bathing suits, skimpy shorts, and mini skirts. Pretty much the same attire found on most Barbies on the store shelves these days. I found it funny when some of the computer players dressed similar to another player. While you can have up to four players, the computer-controlled players put up a decent fight in the mini-games. They do have their drawbacks as well. I have seen them get stuck behind a plant and halt the progress of a scavenger hunt. Fortunately, my daughters didn't experience that problem, but they didn't appreciate the load times between levels. Even still, they both enjoyed playing this game. In fact one of mine decided to play with her real Barbies afterwords. If you have a daughter that enjoys dressing up her Barbies, cleaning animals, stacking cupcakes and putting on make-up, then look no further than Barbie Dreamhouse Party. Thank you Those Awesome Guys for sending us this game to review! Move or Die is a collection of fast-paced mini-games that are best enjoyed with friends (locally or online) or with complete strangers on the internet. Playing offline against bots is possible too, though the only way to unlock new character skins is through online gameplay. Experience is earned if you do well against others and if you drop out of an online match, you could be penalized by not gaining experience for a while. In other words, don’t drop out of the game if you’re losing. Winning or not, the game modes are hilariously fun and worth sticking it out since they last about a minute apiece. Add mutators into the mix and your gameplay experience is bound to be unique each time. Though violence is a given with the title, it’s all in good fun and there is no blood or gore anywhere. As the title suggests, you must keep moving in order to regenerate your depleting health bar. Some of the mutators reverse this mechanic by requiring you to stay still to regenerate health or by having to touch another player in order to live. Other mutators will cause you to kill players upon touching them, randomly drop bombs or change gravity like the game VVVVVV. Chainsaw Backstab – Each player is equipped with a chainsaw that works from behind. If attacked from the front the chainsaws from both players will go flying. Boss Fight – One randomly selected player is a boss while the others try to attack it with their short range tazers. Can the boss survive the attack and win? Sugar Rush – Candy is randomly dropped and whoever can eat the most of it and say alive, wins. Spike Ball – Avoid the spiked ball at all costs! Ghost Scare – Players are mostly invisible and they have to sneak up and scare other players to death. Shifty Ground – Avoid the deadly areas that change every few seconds. Loot Grab – Collect the randomly dispersed loot and bring it to your chest. Make sure others don’t steal from your collection! Speed Run – Try to get to the end before the rest of the players! Static Bounce – Avoid the static balls that appear when players collide. Jump Shot – Try to shoot the other players, but your gun only fires in the air. Hat Chase – Attempt to get the hat and wear it as long as possible. Falling blocks – Avoid the falling blocks that will kill you upon impact. Fizzle Floor – The ground randomly disintegrates; try to stay on the good parts! Bomb Tag – One random player has a bomb strapped to them, keep away from them before it explodes or gets strapped onto you instead! Rocket Run – Avoid the homing missiles. Cleanup Crew – Who can clean the most spots before time runs out? Mind Control – Touch a player to look like them. It is possible to keep track, but it takes more work. God Gun – One random player is given control of an overly powerful gun that can blast the ground and nearby players; survivors will get a chance to return the favor. Building Blocks – Quickly build your own platforms to survive the approaching deadly floor. Hoops – (My family was bad at this one) Your goal here is to make as many baskets as possible. As you can see there’s plenty of variety in the mini-games. Just when you get the hang of some of the modes, a mutator may be implemented that will make it even easier or more challenging. It’s hard to complete a speed run in the dark or to keep track of your character with hundreds of random decoys running around. The jetpack and stabilizer mutators are handy though. Some of the mutators are silly like the NSFW one which blurs out the players. Since its launch there have been over one hundred free updates to the game. The developers are very responsive to player feedback and don’t nickel and dime you for DLC. The base price of $14.99 is reasonable, but this game has been 50% off in Steam sales and is worth every penny. If you like challenging multiplayer games and have a short attention span, then Move or Die will be a perfect fit for you and your loved ones. Although there isn’t any blood or gore, there is some potty humor with character skins showing butts or looking like poop. If that doesn’t bother you, add this game to your wish list! Onion Kingdom is being attacked by a very hungry spaghetti monster. Unfortunately, your team doesn’t have the necessary coordination to appease its ferocious appetite. As a result, the Onion king sends your party back to 1993 to hone your cooking and teamwork skills. In the beginning the kitchens and recipes are manageable, but that changes before long! As if rats and tricky orders were not enough to contend with, the kitchens themselves can be overwhelming at times too. Some of the kitchens have narrow pathways that only allow one chef through at a time while others split apart and come back together due to earthquakes or moving vehicles. One of the levels takes place on a pirate ship and the rough waters caused the counter tops to shuffle around with the roaring waves. If you like Steam achievements, they are often earned after completing notorious levels. Communication is key if you want to succeed in completing successful dishes in a short about of time. Sadly, my kids didn’t appreciate my bossing them around in a louder than normal tone of voice. While I didn’t cuss at them verbally, the Y button on my Xbox One controller showed my chef cussing using silly symbols. Getting four controllers to work on my computer took some effort. We hooked up one Xbox One controller, two Xbox 360 controllers, one wireless and the other hard wired. Finally, we added the Steam controller which seemed to be the least favorite for this game. Keyboard support is available as well but the gamepads work the best in my opinion. While playing cooperatively is fun, there is a verses mode where chefs compete against each other for the best score within the time limit. When my daughter and I competed we each had to control one other chef by using the shoulder button to switch between them. The single player mode plays the same but quite frankly, this game is designed for cooperative play so if you don’t have anyone nearby to play alongside, don’t bother picking up this game. Sadly, there is no online multiplayer. 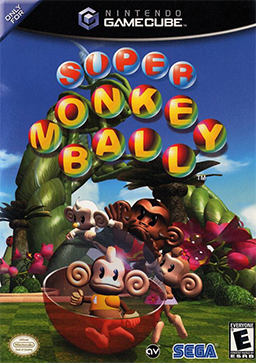 Super Monkey Ball (Released November 18th, 2001) was a great game, but within a year later, Super Monkey Ball 2 was developed and released with a boatload of 6 new mini-games, over 150 floors to play on and more. There are single and multi player modes to be had in SMB2, so let?s start by talking about the single player. For those of you who are not familiar with the franchise, you are a monkey encased in a ball, and using the control stick, you tilt the board around like a 21st century labyrinth. But that catch is that the board may have obstacles like holes, moving parts and ramps on it. When I saw that there was going to be a sequel to the previous hit, I really was looking forward to this game. In this installment, there is a new story mode in which you play through 10 floors at a time, and view a little movie that progresses the story. Story mode can be good and bad; good because you have infinite lives, but bad because once you complete the floor, you can?t do it again to possibly get a better score. The multi-player mode is a different yarn. There are 6 new mini-games in addition to the 6 older, retrofitted mini-games to choose from: Monkey Race, Fight, Target, Golf, Pool, Bowling, Boat, Soccer, Tennis, Shot, Dogfight, and Baseball. All of them are OK, but not stellar games to begin with. The ones that really shine, though, are Target and Dogfight. The graphic quality is great in this game from the low-polygon, and the backgrounds are beautiful, as is the front end! One of the levels that I really like is: ?In the Whale? in which the background is like an underground city. You can watch the water flow back as the whale presumably lurches forward. Scenes like this really show off the excellent graphics. The sound in this game is as good as the graphics are, although the voice acting gets annoying at times. This game apparently supports surround sound, so that is kind of cool. The music in the game isn?t as good as its brother, but it is still great; I guess it kind of lost that peppy ?Get-to-the-finish-soon!? touch to it. From a Christian standpoint, here is the lowdown: At the end of most of the cinematics in story mode, there is a 30-second magical session where the monkeys gather and all chant a harmonic verse and say ?The magical spell is Ei-Ei-Poo.?. To avoid this part, you can simply press the start button when this scene comes up.